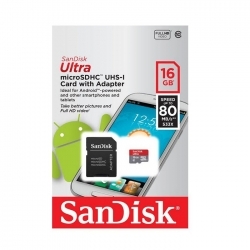 SanDisk Ultra microSDHC/microSDXC UHS-I card are a great choice for android-powered and other smartphones and tablets.With SanDisk Ultra microSD cards you"ll benefit from faster downloads,higher capacity and better performance to capture and store high quality pictures and full HD Video.Take advantage of ultra-fast read speeds of up to 80MB/s to save time moving photos and videos from the cards to your computers.With Class10 video ratings you"ll be ready to capture high quality Full HD video (1080p). 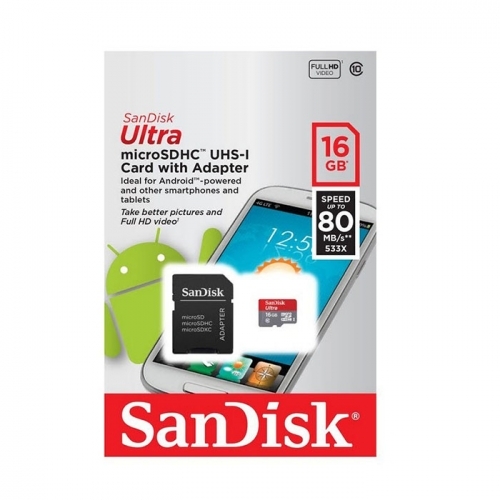 SanDisk card are compatible with android smartphone,tablets and interchangeable-lens cameras. With read speeds of up to 80MB/s,the SanDisk Ultra microSDHC UHS Card lets you transfer high-resolution photos and Full HD video to your computer without a long wait. The SanDisk Ultra microSDHC UHS Card is Class 10,letting you capture smooth Full HD video without interruption.